is Kamloops' first wine tour company and is now the official Sun Peaks shuttle service provider with an expansive fleet of luxury tour vehicles and professional driver guides to ensure that your tour and travel experiences are first class each and every time. 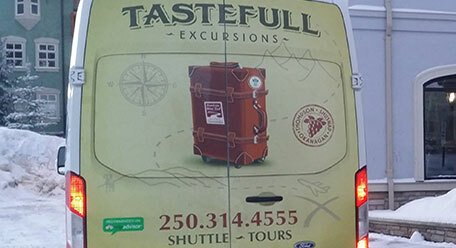 TasteFull Excursions offers a wide variety of transportation services year round throughout the Thompson and Okanagan Valleys plus Whistler, Blue River, Valemount, Revelstoke and Vancouver. Our professional team of drivers provide shuttle and/or charter services on behalf of Mike Wiegele Heli-skiing Resort, Canadian Mountain Holidays, and our local and internationally renowned Sun Peaks Ski Resort. 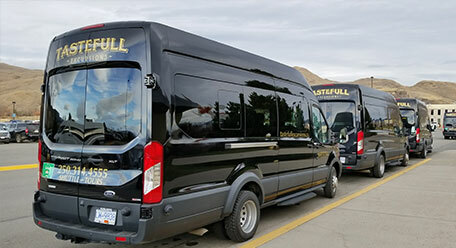 Whether you are part of a corporate group requiring point-to-point transportation, a golf group, a wedding, or a family visiting from overseas who require inter-resort transportation or a shuttle from the Kamloops Airport to your holiday destination – TasteFull Excursions has a myriad of options, rates and fleet vehicles to choose from, including trailers to accommodate luggage and gear. Our expansive fleet that includes 10+ tour vehicles and several trailers that are maintained in peak condition for your luxury and comfort. For safety purposes, protective barriers are installed between the passenger area and the storage space to ensure luggage items are kept secure during transport. WIFI access (if available) and multiple ports are installed to re-charge mobile devices. During the winter season, blankets and pillows are onboard to provide additional comfort and complimentary bottled water is provided for our guest convenience. TasteFull Excursions is not a Motor Coach company. Passenger capacity ranges from 1 – 14 passengers on any of our fleet of vehicles. This allows us to provide an economic alternative to smaller groups who prefer to travel together either in a private, charter arrangement or with others in a more casual atmosphere. Please contact us directly for custom charter rates. And, visit our FLEET page to view our vehicles and other Valuable Information for Travelers.